If you were having trouble trying to figure out what you wanna do this Saturday night, the dudes over at Danzig’s have got it covered for you. Albeit a sort of last minute show — we’re still psyched. We don’t know what the deal is, but it feels like we’ve seen more Turbo Fruits shows lately than Heavy Cream, Natural Child, Pujol, and JEFF shows combined. Not like we’re complaining though, Jonas and the guys bring it everytime and get better and better. 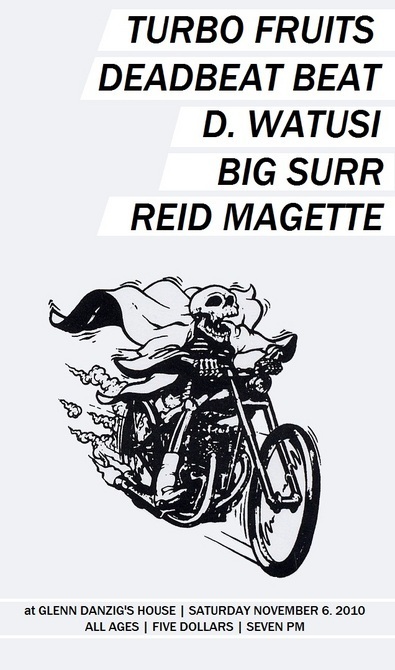 Detroit’s Deadbeat Beat are gonna roll through too and D. Watusi, Big Surr, and Reid Magette are gonna round out the rest of the bill. Word on the street is that those Watusis are gonna be recording their set for a release — make sure to scream all your favorite obscenities. Please note that it’s listed as 7PM, we’ve been told it’ll start promptly right around 8:00.